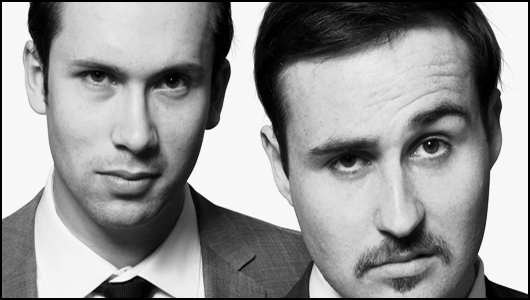 Review: Max and Ivan Are…Con Artists – Pleasance Upstairs, Edinburgh. It’s not easy to recreate the excitement and atmosphere of an Ocean’s Eleven-style heist movie using just two chairs, a toy plane and a dash of audience participation. But Max and Ivan do it so well you’ll think you’re actually cracking a casino safe in Las Vegas…or at the very least, watching them do it. Talk about comedy on a budget. However this show begins fairly low-key. The comedy duo spend the first fifteen minutes of Max and Ivan Are…Con Artists introducing us to the vast range of characters they play in their spoof movie, from Lady Penelope-esque hacker – and adult film star – Lavinia to Graeme, a camp career thief currently working in HR. All the characters, previous accomplices of a Guy Ritchie-style gangster called Jim, have fallen on hard times after a botched job in Monaco. And flashbacks to what happened there provide a lot of the initial laughs in this show. Max and Ivan certainly have a broad range. It’s amazing how well they slip between eight different personae without ever losing track of the narrative. And what a narrative it is; in the space of an hour we’re whisked from the East End of London – via Argentina and a Wetherspoons in Edinburgh – all the way to Las Vegas and a casino run by a completely insane Russian oligarch: Dmitri, played excellently (and moustache-twiddlingly), by Ivan. If you checked out last year’s show, Max and Ivan are Holmes and Watson you’ll know just how slick they can be, but this year they’ve ramped it up a notch. Their timing, use of music and lighting combine with pitch-perfect characterisation to create a vivid atmosphere. It’s really a stunning performance from Max and Ivan. You begin to bond with the characters, such is their skill, and by the end of the show you’re genuinely worried about whether they’ll successfully execute the heist. And despite the frequent laughs and great gags, you become so wrapped up in the story it almost feels real…or maybe that was just me. I’m quite impressionable. One thing’s for sure; it’s certainly a show you’ll be thinking about for a while. But just one word of warning: if you take beer into the venue with you, be sure to guard it from The Architect.